19 AMGr Twin 5-Spoke Wheels, Active Parking Assist, Adaptive Highbeam Assist, AIR BALANCE Package, AMG Bodystyling, AMG Line Exterior, Black Headliner, Blind Spot Assist, Burmester Surround Sound System, Corner-Illuminating Lamps, Electronic Trunk Closer, Full LED Headlamps, HANDS-FREE ACCESS, Heated Front Seats, Inductive Wireless Charging with NFC Pairing, KEYLESS GO Comfort Package, KEYLESS GOr, LED Logo Projector, Lighting Package, Perforated Front Brake Discs, Power Rear-Window Shade, Premium 2 Package (Q02), Rear-View Camera, SiriusXM Satellite Radio, Spoiler. 20/27 City/Highway MPG We know you would like to see this car up close so call Todd Frison, Isaac Weaver, or Matt Bourassa to schedule an appointment!! Proudly serving Gilbert, Casa Grande, Chandler, Scottsdale, Peoria, Surprise, Avondale, Tucson, Mesa, Phoenix. Please call 1-855-717-7620. - Air Conditioning, Climate Control, Dual Zone Climate Control, Cruise Control, Power Steering, Power Mirrors, Leather Steering Wheel, Memory Seat Position, Clock, Tachometer, Homelink System, Telescoping Steering Wheel, Steering Wheel Radio Controls, Sunroof, Moonroof, Driver Airbag, Passenger Airbag, Side Airbags, Security System, Rear Defogger, Intermittent Wipers, Anti-Theft, MB TEX Interior Surface, Aux. Audio Input, Carpeted Floor Mats, Center Arm Rest, Child Proof Door Locks, Daytime Running Lights, Front Heated Seats, Heated Mirrors, Navigation System, Overhead Console, Rear Fog Lamps, Rear Spoiler, Rear Spoiler, Remote Fuel Door, Remote Trunk Lid, Reverse Camera, Roll Stability Control, Side Curtain Airbags, Tire Pressure Monitor, Vanity Mirrors -19 AMGr Twin 5-Spoke Wheels, Active Parking Assist, Adaptive Highbeam Assist, AIR BALANCE Package, AMG Bodystyling, AMG Line Exterior, Black Headliner, Blind Spot Assist, Burmester Surround Sound System, Corner-Illuminating Lamps, Electronic Trunk Closer, Full LED Headlamps, HANDS-FREE ACCESS, Heated Front Seats, Inductive Wireless Charging with NFC Pairing, KEYLESS GO Comfort Package, KEYLESS GOr, LED Logo Projector, Lighting Package, Perforated Front Brake Discs, Power Rear-Window Shade, Premium 2 Package (Q02), Rear-View Camera, SiriusXM Satellite Radio, Spoiler. 4MATIC, 19 AMGr Twin 5-Spoke Wheels, AMG Line Exterior, AMGr Body Styling, Black Headliner, Blind Spot Assist, Burmester Surround Sound System, Center Console in Natural Grain Black Ash Wood, Comfort Box, Electronic Trunk Closer, Hands-Free Access, Heated Front Seats, Inductive Wireless Charging with NFC Pairing, KEYLESS GO Comfort Package, KEYLESS GOr, Lowered Suspension with Selective Damping, Parking Assistance Package, Perforated Front Brake Discs, Premium Package, SiriusXM Radio, Spoiler, Sport Exterior, Sport Interior. 20/28 City/Highway MPG We know you would like to see this car up close so call Todd Frison, Isaac Weaver, or Matt Bourassa to schedule an appointment!! Proudly serving Gilbert, Casa Grande, Chandler, Scottsdale, Peoria, Surprise, Avondale, Tucson, Mesa, Phoenix. Please call 1-855-717-7620. - Air Conditioning, Climate Control, Dual Zone Climate Control, Cruise Control, Power Steering, Power Mirrors, Leather Steering Wheel, Memory Seat Position, Wood Trim, Clock, Tachometer, Homelink System, Telescoping Steering Wheel, Steering Wheel Radio Controls, Sunroof, Moonroof, Driver Airbag, Passenger Airbag, Side Airbags, Security System, Rear Defogger, Intermittent Wipers, Anti-Theft, MB TEX Interior Surface, Aux. Audio Input, Carpeted Floor Mats, Center Arm Rest, Center Console, Child Proof Door Locks, Daytime Running Lights, Heated Mirrors, Navigation System, Overhead Console, Rear Fog Lamps, Rear Spoiler, Rear Spoiler, Remote Fuel Door, Remote Trunk Lid, Reverse Camera, Roll Stability Control, Side Curtain Airbags, Tire Pressure Monitor, Vanity Mirrors -4MATIC, 19 AMGr Twin 5-Spoke Wheels, AMG Line Exterior, AMGr Body Styling, Black Headliner, Blind Spot Assist, Burmester Surround Sound System, Center Console in Natural Grain Black Ash Wood, Comfort Box, Electronic Trunk Closer, Hands-Free Access, Heated Front Seats, Inductive Wireless Charging with NFC Pairing, KEYLESS GO Comfort Package, KEYLESS GOr, Lowered Suspension with Selective Damping, Parking Assistance Package, Perforated Front Brake Discs, Premium Package, SiriusXM Radio, Spoiler, Sport Exterior, Sport Interior. Rearview Camera, 10.25 Center Display, 12.3 Digital Instrument Cluster, Burmester Premium Sound System, Crystal Grey Fabric Headliner, Electronic Trunk Closer, HANDS-FREE ACCESS, HANDS-FREE Comfort Package, KEYLESS GOr, Premium Package, SiriusXM Satellite Radio, Wheels: 18 Twin 5-Spoke. 23/34 City/Highway MPG We know you would like to see this car up close so call Todd Frison, Isaac Weaver, or Matt Bourassa to schedule an appointment!! Proudly serving Gilbert, Casa Grande, Chandler, Scottsdale, Peoria, Surprise, Avondale, Tucson, Mesa, Phoenix. Please call 1-855-717-7620. - Air Conditioning, Climate Control, Dual Zone Climate Control, Cruise Control, Power Steering, Power Mirrors, Leather Steering Wheel, Memory Seat Position, Clock, Tachometer, Homelink System, Telescoping Steering Wheel, Steering Wheel Radio Controls, Sunroof, Moonroof, Driver Airbag, Passenger Airbag, Security System, Rear Defogger, Intermittent Wipers, Anti-Theft, MB TEX Interior Surface, Body Side Moldings, Carpeted Floor Mats, Center Arm Rest, Child Proof Door Locks, Daytime Running Lights, Heated Mirrors, Navigation System, Overhead Console, Rear Fog Lamps, Rear-Side Airbags, Reverse Camera, Roll Stability Control, Side Curtain Airbags, Tire Pressure Monitor, Vanity Mirrors -Rearview Camera, 10.25 Center Display, 12.3 Digital Instrument Cluster, Burmester Premium Sound System, Crystal Grey Fabric Headliner, Electronic Trunk Closer, HANDS-FREE ACCESS, HANDS-FREE Comfort Package, KEYLESS GOr, Premium Package, SiriusXM Satellite Radio, Wheels: 18 Twin 5-Spoke. Active Blind Spot Assist, Active Brake Assist with Cross-Traffic Function, Active Lane Keeping Assist, Air Ionization with Air Filter, Ambient Lighting, Bang & Olufsen BeoSound System Package, BAS PLUS, Black Headliner, Brushed Aluminum Illuminated Running Boards, CMS Pedestrian, Distance Pilot DISTRONIC & Steering Pilot, DISTRONIC PLUS with Cross-Traffic Assist, Driver Assistance Package, Heated & Cooled Front Cupholders, Heated & Ventilated Front Seats, Night Package (P55), Parking Package, Parking Pilot, Premium 3 Package, PRESAFE Brake with Pedestrian Recognition, PRESAFE PLUS, Rear-Seat Center-Armrest Pass-Through, Speed Limit Assist, Surround View System, Wheels: 22 AMG Twin 5-Spoke with Black Accents. We know you would like to see this car up close so call Todd Frison, Isaac Weaver, or Matt Bourassa to schedule an appointment!! Proudly serving Gilbert, Casa Grande, Chandler, Scottsdale, Peoria, Surprise, Avondale, Tucson, Mesa, Phoenix. Please call 1-855-717-7620. - Air Conditioning, Climate Control, Dual Zone Climate Control, Cruise Control, Tinted Windows, Power Steering, Power Mirrors, Leather Steering Wheel, Clock, Tachometer, Homelink System, Telescoping Steering Wheel, Steering Wheel Radio Controls, Driver Airbag, Passenger Airbag, Side Airbags, Security System, Rear Defogger, Intermittent Wipers, CD Player, Anti-Theft, Leather Interior Surface, Adaptive headlights, Aux. Audio Input, Carpeted Floor Mats, Center Arm Rest, Child Proof Door Locks, Daytime Running Lights, Front Heated Seats, Heated Mirrors, Navigation System, Power Lift Gate, Premium Sound, Rear Fog Lamps, Rear Spoiler, Rear Spoiler, Remote Trunk Lid, Reverse Camera, Roll Stability Control, Side Curtain Airbags, Sport Seats, Tire Pressure Monitor, Vanity Mirrors -Active Blind Spot Assist, Active Brake Assist with Cross-Traffic Function, Active Lane Keeping Assist, Air Ionization with Air Filter, Ambient Lighting, Bang & Olufsen BeoSound System Package, BAS PLUS, Black Headliner, Brushed Aluminum Illuminated Running Boards, CMS Pedestrian, Distance Pilot DISTRONIC & Steering Pilot, DISTRONIC PLUS with Cross-Traffic Assist, Driver Assistance Package, Heated & Cooled Front Cupholders, Heated & Ventilated Front Seats, Night Package (P55), Parking Package, Parking Pilot, Premium 3 Package, PRESAFE Brake with Pedestrian Recognition, PRESAFE PLUS, Rear-Seat Center-Armrest Pass-Through, Speed Limit Assist, Surround View System, Wheels: 22 AMG Twin 5-Spoke with Black Accents. Rearview Camera, Anthracite Poplar Wood Trim, Black Headliner, harman/kardonr Logic 7r Surround Sound System, Heated Front Seats, Wheels: 21 AMG Twin 5-Spoke with Black Accents. We know you would like to see this car up close so call Todd Frison, Isaac Weaver, or Matt Bourassa to schedule an appointment!! Proudly serving Gilbert, Casa Grande, Chandler, Scottsdale, Peoria, Surprise, Avondale, Tucson, Mesa, Phoenix. Please call 1-855-717-7620. - Air Conditioning, Climate Control, Dual Zone Climate Control, Cruise Control, Tinted Windows, Power Steering, Power Mirrors, Leather Steering Wheel, Clock, Tachometer, Homelink System, Telescoping Steering Wheel, Steering Wheel Radio Controls, Driver Airbag, Passenger Airbag, Side Airbags, Security System, Rear Defogger, Intermittent Wipers, CD Player, Anti-Theft, MB TEX Interior Surface, Adaptive headlights, Aux. Audio Input, Carpeted Floor Mats, Center Arm Rest, Child Proof Door Locks, Daytime Running Lights, Front Heated Seats, Heated Mirrors, Navigation System, Power Lift Gate, Premium Sound, Rear Fog Lamps, Rear Spoiler, Rear Spoiler, Remote Trunk Lid, Reverse Camera, Roll Stability Control, Side Curtain Airbags, Sport Seats, Tire Pressure Monitor, Vanity Mirrors -Rearview Camera, Anthracite Poplar Wood Trim, Black Headliner, harman/kardonr Logic 7r Surround Sound System, Heated Front Seats, Wheels: 21 AMG Twin 5-Spoke with Black Accents. Nut Brown/Black with Exclusive Nappa Leather Upholstery, Active Distance Assist DISTRONIC, Active Lane Change Assist, Active Parking Assist, Active Steering Assist, Automatic Speed Takeover, Black Headliner, Comfort Box, Driver Assistance Package, Driver Assistance Package (23P), Extended Restart by Stop & Go, Front Variable Heated Seats, HANDS-FREE ACCESS, Heated & Ventilated Front Seats, KEYLESS GO Comfort Package, KEYLESS GOr, Multicontour Front Seats with Massage Feature, Power Rear-Window Sunshades, Premium Package, Rear Spoiler, Route Based Speed Adaptation, Speed Limit Assist, Surround View Camera, Wheels: 20 Multispoke. 17/27 City/Highway MPG We know you would like to see this car up close so call Todd Frison, Isaac Weaver, or Matt Bourassa to schedule an appointment!! Proudly serving Gilbert, Casa Grande, Chandler, Scottsdale, Peoria, Surprise, Avondale, Tucson, Mesa, Phoenix. Please call 1-855-717-7620. - Air Conditioning, Climate Control, Dual Zone Climate Control, Cruise Control, Power Steering, Power Mirrors, Leather Steering Wheel, Clock, Tachometer, Homelink System, Telescoping Steering Wheel, Steering Wheel Radio Controls, Driver Airbag, Passenger Airbag, Security System, Rear Defogger, Intermittent Wipers, AM/FM, Leather Interior Surface, Adaptive headlights, Carpeted Floor Mats, Center Arm Rest, Child Proof Door Locks, Daytime Running Lights, Front Heated Seats, Heated Mirrors, Navigation System, Overhead Console, Rear Fog Lamps, Rear-Side Airbags, Reverse Camera, Roll Stability Control, Side Curtain Airbags, Tire Pressure Monitor, Vanity Mirrors -Nut Brown/Black with Exclusive Nappa Leather Upholstery, Active Distance Assist DISTRONIC, Active Lane Change Assist, Active Parking Assist, Active Steering Assist, Automatic Speed Takeover, Black Headliner, Comfort Box, Driver Assistance Package, Driver Assistance Package (23P), Extended Restart by Stop & Go, Front Variable Heated Seats, HANDS-FREE ACCESS, Heated & Ventilated Front Seats, KEYLESS GO Comfort Package, KEYLESS GOr, Multicontour Front Seats with Massage Feature, Power Rear-Window Sunshades, Premium Package, Rear Spoiler, Route Based Speed Adaptation, Speed Limit Assist, Surround View Camera, Wheels: 20 Multispoke. I6, 12.3 Digital Instrument Cluster, AMG Floor Mats, AMG Line, AMG Line Exterior Package Code, AMG Line Interior Package Code, Black Headliner, Burmester Surround Sound System, Heated & Active Ventilated Front Seats, Inductive Wireless Charging with NFC Pairing, Multi-Function Sports Steering Wheel with Flat Bottom, Power Rear Window Sunshade, Premium Package, Rear Deck Spoiler, Round Multifunction Steering Wheel, SiriusXM Radio, Wheels: 20 AMG Multi-Spoke. 24/31 City/Highway MPG We know you would like to see this car up close so call Todd Frison, Isaac Weaver, or Matt Bourassa to schedule an appointment!! Proudly serving Gilbert, Casa Grande, Chandler, Scottsdale, Peoria, Surprise, Avondale, Tucson, Mesa, Phoenix. Please call 1-855-717-7620. - Air Conditioning, Climate Control, Dual Zone Climate Control, Cruise Control, Power Steering, Power Mirrors, Leather Steering Wheel, Power Drivers Seat, Power Passenger Seat, Memory Seat Position, Clock, Tachometer, Homelink System, Telescoping Steering Wheel, Steering Wheel Radio Controls, Sunroof, Moonroof, Driver Airbag, Passenger Airbag, Side Airbags, Security System, Rear Defogger, Intermittent Wipers, AM/FM, Leather Interior Surface, Aux. Audio Input, Bluetooth, Carpeted Floor Mats, Center Arm Rest, Child Proof Door Locks, Daytime Running Lights, Front Heated Seats, Heated Mirrors, Navigation System, Overhead Console, Reverse Camera, Roll Stability Control, Side Curtain Airbags, Tire Pressure Monitor, Vanity Mirrors -I6, 12.3 Digital Instrument Cluster, AMG Floor Mats, AMG Line, AMG Line Exterior Package Code, AMG Line Interior Package Code, Black Headliner, Burmester Surround Sound System, Heated & Active Ventilated Front Seats, Inductive Wireless Charging with NFC Pairing, Multi-Function Sports Steering Wheel with Flat Bottom, Power Rear Window Sunshade, Premium Package, Rear Deck Spoiler, Round Multifunction Steering Wheel, SiriusXM Radio, Wheels: 20 AMG Multi-Spoke. 3.0L I6 Turbo, 115V Power Outlet, 20 Twin 5-Spoke Wheels, Burmester Surround Sound System, Crystal Grey Headliner, Interior Ambient Lighting with Illuminated Door Sills, Premium Package, Pre-Wiring for Rear Seat Entertainment & Comfort, SiriusXM radio, Trailer Hitch, Wireless Charging. We know you would like to see this car up close so call Todd Frison, Isaac Weaver, or Matt Bourassa to schedule an appointment!! Proudly serving Gilbert, Casa Grande, Chandler, Scottsdale, Peoria, Surprise, Avondale, Tucson, Mesa, Phoenix. Please call 1-855-717-7620. - Air Conditioning, Climate Control, Dual Zone Climate Control, Cruise Control, Tinted Windows, Power Steering, Power Mirrors, Leather Steering Wheel, Memory Seat Position, Clock, Tachometer, Homelink System, Telescoping Steering Wheel, Steering Wheel Radio Controls, Sunroof, Moonroof, Driver Airbag, Passenger Airbag, Side Airbags, Security System, Rear Defogger, Intermittent Wipers, Anti-Theft, MB TEX Interior Surface, Air Conditioned Seats, Carpeted Floor Mats, Center Arm Rest, Center Console, Child Proof Door Locks, Daytime Running Lights, Front AC Seats, Heated Mirrors, Power Lift Gate, Premium Sound, Rear Fog Lamps, Rear Spoiler, Rear Spoiler, Rear Wipers, Remote Trunk Lid, Reverse Camera, Roll Stability Control, Side Curtain Airbags, Tire Pressure Monitor, Vanity Mirrors -3.0L I6 Turbo, 115V Power Outlet, 20 Twin 5-Spoke Wheels, Burmester Surround Sound System, Crystal Grey Headliner, Interior Ambient Lighting with Illuminated Door Sills, Premium Package, Pre-Wiring for Rear Seat Entertainment & Comfort, SiriusXM radio, Trailer Hitch, Wireless Charging. Panorama Roof, AMG DYNAMIC PLUS Package, Blind Spot Assist, Dynamic Engine/Transmission Mounts, Full DINAMICA AMG Performance Steering Wheel, Lane Keeping Assist, Lane Tracking Package, Wheels: 19 Fr/20 Rr AMG Split 5-Spoke Silver. We know you would like to see this car up close so call Todd Frison, Isaac Weaver, or Matt Bourassa to schedule an appointment!! Proudly serving Gilbert, Casa Grande, Chandler, Scottsdale, Peoria, Surprise, Avondale, Tucson, Mesa, Phoenix. Please call 1-855-717-7620. - Air Conditioning, Climate Control, Dual Zone Climate Control, Cruise Control, Power Steering, Power Windows, Power Mirrors, Leather Steering Wheel, Clock, Tachometer, Telescoping Steering Wheel, Steering Wheel Radio Controls, Driver Airbag, Passenger Airbag, Side Airbags, Security System, Rear Defogger, Intermittent Wipers, CD Player, Anti-Theft, Leather Interior Surface, Aux. Audio Input, Bluetooth, Carpeted Floor Mats, Center Arm Rest, Cup Holders, Daytime Running Lights, Front Heated Seats, Navigation System, Overhead Console, Parking Sensors, Premium Sound, Rear Fog Lamps, Rear Spoiler, Rear Spoiler, Reverse Camera, Roll Stability Control, Side Curtain Airbags, Tire Pressure Monitor, Vanity Mirrors -Panorama Roof, AMG DYNAMIC PLUS Package, Blind Spot Assist, Dynamic Engine/Transmission Mounts, Full DINAMICA AMG Performance Steering Wheel, Lane Keeping Assist, Lane Tracking Package, Wheels: 19 Fr/20 Rr AMG Split 5-Spoke Silver. Black Leather, Active Distance Assist DISTRONIC, Active Lane Change Assist, Active Parking Assist, Active Steering Assist, Automatic Speed Takeover, Black Headliner, Comfort Box, Driver Assistance Package, Driver Assistance Package (23P), Extended Restart by Stop & Go, Front Variable Heated Seats, HANDS-FREE ACCESS, Heated & Ventilated Front Seats, KEYLESS GO Comfort Package, KEYLESS GOr, Multicontour Front Seats with Massage Feature, Nappa Leather Steering Wheel, Power Rear-Window Sunshades, Premium Package, Route Based Speed Adaptation, Speed Limit Assist, Surround View Camera, Wheels: 20 Triple 5-Spoke. 17/27 City/Highway MPG We know you would like to see this car up close so call Todd Frison, Isaac Weaver, or Matt Bourassa to schedule an appointment!! Proudly serving Gilbert, Casa Grande, Chandler, Scottsdale, Peoria, Surprise, Avondale, Tucson, Mesa, Phoenix. Please call 1-855-717-7620. - Air Conditioning, Climate Control, Dual Zone Climate Control, Cruise Control, Power Steering, Power Mirrors, Leather Steering Wheel, Clock, Tachometer, Homelink System, Telescoping Steering Wheel, Steering Wheel Radio Controls, Driver Airbag, Passenger Airbag, Security System, Rear Defogger, Intermittent Wipers, AM/FM, Leather Interior Surface, Adaptive headlights, Carpeted Floor Mats, Center Arm Rest, Child Proof Door Locks, Daytime Running Lights, Front Heated Seats, Heated Mirrors, Navigation System, Overhead Console, Rear Fog Lamps, Rear-Side Airbags, Reverse Camera, Roll Stability Control, Side Curtain Airbags, Tire Pressure Monitor, Vanity Mirrors -Black Leather, Active Distance Assist DISTRONIC, Active Lane Change Assist, Active Parking Assist, Active Steering Assist, Automatic Speed Takeover, Black Headliner, Comfort Box, Driver Assistance Package, Driver Assistance Package (23P), Extended Restart by Stop & Go, Front Variable Heated Seats, HANDS-FREE ACCESS, Heated & Ventilated Front Seats, KEYLESS GO Comfort Package, KEYLESS GOr, Multicontour Front Seats with Massage Feature, Nappa Leather Steering Wheel, Power Rear-Window Sunshades, Premium Package, Route Based Speed Adaptation, Speed Limit Assist, Surround View Camera, Wheels: 20 Triple 5-Spoke. Rearview Camera, AMG Night Package, AMG Performance Exhaust System, Android Auto, Apple CarPlay, Black Fabric Headliner, Night Package (P55), Smartphone Integration, Smartphone Integration Package, Wheels: 20 AMG Multi-Spoke with Black Accents. We know you would like to see this car up close so call Todd Frison, Isaac Weaver, or Matt Bourassa to schedule an appointment!! Proudly serving Gilbert, Casa Grande, Chandler, Scottsdale, Peoria, Surprise, Avondale, Tucson, Mesa, Phoenix. Please call 1-855-717-7620. - Air Conditioning, Climate Control, Dual Zone Climate Control, Cruise Control, Tinted Windows, Power Steering, Power Mirrors, Leather Steering Wheel, Clock, Tachometer, Homelink System, Telescoping Steering Wheel, Steering Wheel Radio Controls, Driver Airbag, Passenger Airbag, Side Airbags, Security System, Rear Defogger, Intermittent Wipers, AM/FM, CD Player, Anti-Theft, Leather Interior Surface, Aux. Audio Input, Bluetooth, Carpeted Floor Mats, Center Arm Rest, Child Proof Door Locks, Daytime Running Lights, Front Heated Seats, Heated Mirrors, Overhead Console, Power Lift Gate, Rear Fog Lamps, Rear Wipers, Remote Trunk Lid, Reverse Camera, Roll Stability Control, Side Curtain Airbags, Sport Seats, Tire Pressure Monitor, Vanity Mirrors -Rearview Camera, AMG Night Package, AMG Performance Exhaust System, Android Auto, Apple CarPlay, Black Fabric Headliner, Night Package (P55), Smartphone Integration, Smartphone Integration Package, Wheels: 20 AMG Multi-Spoke with Black Accents. Rearview Camera, 10.25 Center Display, 12.3 Digital Instrument Cluster, 64-Color Ambient Lighting, Black Rear Spoiler, Blind Spot Assist, Burmester Premium Sound System, Comfort Box, Crystal Grey Fabric Headliner, Electronic Trunk Closer, HANDS-FREE ACCESS, HANDS-FREE Comfort Package, Heated Front Seats, Illuminated Door Sills, KEYLESS GOr, Multifunction Sport Steering Wheel, Premium Package, SiriusXM Satellite Radio, Wheels: 18 Multispoke with Black Accents. 23/34 City/Highway MPG We know you would like to see this car up close so call Todd Frison, Isaac Weaver, or Matt Bourassa to schedule an appointment!! Proudly serving Gilbert, Casa Grande, Chandler, Scottsdale, Peoria, Surprise, Avondale, Tucson, Mesa, Phoenix. Please call 1-855-717-7620. - Air Conditioning, Climate Control, Dual Zone Climate Control, Cruise Control, Power Steering, Power Mirrors, Leather Steering Wheel, Memory Seat Position, Clock, Tachometer, Homelink System, Telescoping Steering Wheel, Steering Wheel Radio Controls, Sunroof, Moonroof, Driver Airbag, Passenger Airbag, Security System, Rear Defogger, Intermittent Wipers, Anti-Theft, MB TEX Interior Surface, Body Side Moldings, Carpeted Floor Mats, Center Arm Rest, Child Proof Door Locks, Daytime Running Lights, Heated Mirrors, Navigation System, Overhead Console, Rear Fog Lamps, Rear-Side Airbags, Reverse Camera, Roll Stability Control, Side Curtain Airbags, Tire Pressure Monitor, Vanity Mirrors -Rearview Camera, 10.25 Center Display, 12.3 Digital Instrument Cluster, 64-Color Ambient Lighting, Black Rear Spoiler, Blind Spot Assist, Burmester Premium Sound System, Comfort Box, Crystal Grey Fabric Headliner, Electronic Trunk Closer, HANDS-FREE ACCESS, HANDS-FREE Comfort Package, Heated Front Seats, Illuminated Door Sills, KEYLESS GOr, Multifunction Sport Steering Wheel, Premium Package, SiriusXM Satellite Radio, Wheels: 18 Multispoke with Black Accents. 4MATIC, 12.3 Digital Instrument Cluster, 64-Color Ambient Lighting, Adaptive Highbeam Assist, AMG Night Package, AMG Performance Exhaust, AMG Performance Steering Wheel in Nappa, AMGr Illuminated Door Sills, Blind Spot Assist, COMAND Navigation, Exterior Lighting Package, Heated & Ventilated Front Seats, Inductive Wireless Charging with NFC Pairing, LED Intelligent Light System, Live Traffic, Multimedia Package, Navigation Map Updates Included for 3 Years, Night Package (P55), Parking Assistance Package, PARKTRONIC with Active Parking Assist, Surround View System, Telephone Pre-Wiring/Portable Phone, Wheels: 19 AMG Twin 5-Spoke with Black Accents. We know you would like to see this car up close so call Todd Frison, Isaac Weaver, or Matt Bourassa to schedule an appointment!! Proudly serving Gilbert, Casa Grande, Chandler, Scottsdale, Peoria, Surprise, Avondale, Tucson, Mesa, Phoenix. Please call 1-855-717-7620. - Air Conditioning, Climate Control, Dual Zone Climate Control, Cruise Control, Power Steering, Power Mirrors, Leather Steering Wheel, Clock, Tachometer, Homelink System, Steering Wheel Radio Controls, Driver Airbag, Passenger Airbag, Security System, Rear Defogger, Intermittent Wipers, AM/FM, CD Player, Anti-Theft, Leather Interior Surface, Aux. Audio Input, Carpeted Floor Mats, Center Arm Rest, Daytime Running Lights, Front Heated Seats, Heated Mirrors, Overhead Console, Rear Fog Lamps, Rear Spoiler, Rear Spoiler, Rear-Side Airbags, Reverse Camera, Roll Stability Control, Side Curtain Airbags, Tire Pressure Monitor, Vanity Mirrors -4MATIC, 12.3 Digital Instrument Cluster, 64-Color Ambient Lighting, Adaptive Highbeam Assist, AMG Night Package, AMG Performance Exhaust, AMG Performance Steering Wheel in Nappa, AMGr Illuminated Door Sills, Blind Spot Assist, COMAND Navigation, Exterior Lighting Package, Heated & Ventilated Front Seats, Inductive Wireless Charging with NFC Pairing, LED Intelligent Light System, Live Traffic, Multimedia Package, Navigation Map Updates Included for 3 Years, Night Package (P55), Parking Assistance Package, PARKTRONIC with Active Parking Assist, Surround View System, Telephone Pre-Wiring/Portable Phone, Wheels: 19 AMG Twin 5-Spoke with Black Accents. Rearview Camera, Panorama Roof, Android Auto, Apple CarPlay, Blind Spot Assist, Brushed Aluminum Running Boards, Crystal Grey Fabric Headliner, Heated Front Seats, Illuminated Star, KEYLESS GOr, Natural Grain Black Ash Wood Trim, Premium Package, Rear Chrome Trim, SiriusXM Satellite Radio, Smartphone Integration, Smartphone Integration Package, Wheels: 18 5-Spoke (R31). 22/27 City/Highway MPG We know you would like to see this car up close so call Todd Frison, Isaac Weaver, or Matt Bourassa to schedule an appointment!! Proudly serving Gilbert, Casa Grande, Chandler, Scottsdale, Peoria, Surprise, Avondale, Tucson, Mesa, Phoenix. Please call 1-855-717-7620. - Air Conditioning, Climate Control, Dual Zone Climate Control, Cruise Control, Tinted Windows, Power Steering, Power Mirrors, Leather Steering Wheel, Clock, Tachometer, Homelink System, Telescoping Steering Wheel, Steering Wheel Radio Controls, Driver Airbag, Passenger Airbag, Side Airbags, Security System, Rear Defogger, Intermittent Wipers, AM/FM, CD Player, Anti-Theft, MB TEX Interior Surface, Aux. Audio Input, Bluetooth, Carpeted Floor Mats, Center Arm Rest, Child Proof Door Locks, Daytime Running Lights, Front Heated Seats, Heated Mirrors, Overhead Console, Power Lift Gate, Rear Fog Lamps, Rear Wipers, Remote Trunk Lid, Reverse Camera, Roll Stability Control, Side Curtain Airbags, Tire Pressure Monitor, Vanity Mirrors -Rearview Camera, Panorama Roof, Android Auto, Apple CarPlay, Blind Spot Assist, Brushed Aluminum Running Boards, Crystal Grey Fabric Headliner, Heated Front Seats, Illuminated Star, KEYLESS GOr, Natural Grain Black Ash Wood Trim, Premium Package, Rear Chrome Trim, SiriusXM Satellite Radio, Smartphone Integration, Smartphone Integration Package, Wheels: 18 5-Spoke (R31). 18 5-Spoke Alloy Wheels, 8 Color Display Upgrade, Android Auto, Apple CarPlay, Black Headliner, Blind Spot Assist, HANDS-FREE ACCESS, Heated Front Seats, KEYLESS GOr, Premium Package, Radio: Audio 20 CD with Garmin Navigation Pre-Wiring, Rear Spoiler, Single CD Player, SiriusXM Satellite Radio, Smartphone Integration, Smartphone Integration (14U). 24/37 City/Highway MPG We know you would like to see this car up close so call Todd Frison, Isaac Weaver, or Matt Bourassa to schedule an appointment!! Proudly serving Gilbert, Casa Grande, Chandler, Scottsdale, Peoria, Surprise, Avondale, Tucson, Mesa, Phoenix. Please call 1-855-717-7620. - Air Conditioning, Climate Control, Dual Zone Climate Control, Cruise Control, Power Steering, Power Mirrors, Leather Steering Wheel, Clock, Tachometer, Telescoping Steering Wheel, Steering Wheel Radio Controls, Driver Airbag, Passenger Airbag, Side Airbags, Security System, Rear Defogger, Intermittent Wipers, AM/FM, CD Player, Anti-Theft, MB TEX Interior Surface, Bluetooth, Carpeted Floor Mats, Center Arm Rest, Child Proof Door Locks, Daytime Running Lights, Heated Mirrors, Overhead Console, Rear Fog Lamps, Reverse Camera, Roll Stability Control, Side Curtain Airbags, Tire Pressure Monitor, Vanity Mirrors -18 5-Spoke Alloy Wheels, 8 Color Display Upgrade, Android Auto, Apple CarPlay, Black Headliner, Blind Spot Assist, HANDS-FREE ACCESS, Heated Front Seats, KEYLESS GOr, Premium Package, Radio: Audio 20 CD with Garmin Navigation Pre-Wiring, Rear Spoiler, Single CD Player, SiriusXM Satellite Radio, Smartphone Integration, Smartphone Integration (14U). 18 5-Spoke Aluminum Wheels, Android Auto, Apple CarPlay, Ash Roof Liner, Auto-Dimming Rearview & Driver-Side Mirrors, Blind Spot Assist, Compass, Convenience Package, Garage Door Opener, Smartphone Integration, Smartphone Integration (14U). 24/33 City/Highway MPG We know you would like to see this car up close so call Todd Frison, Isaac Weaver, or Matt Bourassa to schedule an appointment!! Proudly serving Gilbert, Casa Grande, Chandler, Scottsdale, Peoria, Surprise, Avondale, Tucson, Mesa, Phoenix. Please call 1-855-717-7620. - Air Conditioning, Climate Control, Dual Zone Climate Control, Cruise Control, Tinted Windows, Power Steering, Power Mirrors, Leather Steering Wheel, Clock, Tachometer, Telescoping Steering Wheel, Steering Wheel Radio Controls, Driver Airbag, Passenger Airbag, Side Airbags, Security System, Rear Defogger, Fog Lights, Intermittent Wipers, AM/FM, Anti-Theft, MB TEX Interior Surface, Bluetooth, Carpeted Floor Mats, Center Arm Rest, Child Proof Door Locks, Daytime Running Lights, Heated Mirrors, Overhead Console, Power Lift Gate, Rear Fog Lamps, Rear Spoiler, Rear Spoiler, Rear Wipers, Remote Trunk Lid, Reverse Camera, Roll Stability Control, Side Curtain Airbags, Tire Pressure Monitor, Vanity Mirrors -18 5-Spoke Aluminum Wheels, Android Auto, Apple CarPlay, Ash Roof Liner, Auto-Dimming Rearview & Driver-Side Mirrors, Blind Spot Assist, Compass, Convenience Package, Garage Door Opener, Smartphone Integration, Smartphone Integration (14U). 10.25 Digital Instrument Cluster Display, 10.25 Touchscreen Multimedia Display, 18 AMGr 5-Spoke Wheels, 64-Color Interior Ambient Lighting, AMG Line, AMG Line Code, AMG Line Sport Steering Wheel, AMGr Body Styling, Auto-Dimming Rearview & Driver-Side Mirrors, Black Headliner, Black Window Trim & Black Lamella Inlays, Blind Spot Assist, Connect20, Galvanized Shift Paddles, Garage Door Opener, HANDS-FREE ACCESS, Heated Front Seats, Inductive Wireless Charging with NFC Pairing, KEYLESS GO Package, KEYLESS GOr, Mirror Package, Night Package, Power Folding Side Mirrors, Premium Package, Sport Seats with Separate Headrests. 24/35 City/Highway MPG We know you would like to see this car up close so call Todd Frison, Isaac Weaver, or Matt Bourassa to schedule an appointment!! Proudly serving Gilbert, Casa Grande, Chandler, Scottsdale, Peoria, Surprise, Avondale, Tucson, Mesa, Phoenix. Please call 1-855-717-7620. - Air Conditioning, Climate Control, Dual Zone Climate Control, Cruise Control, Power Steering, Power Mirrors, Leather Steering Wheel, Clock, Tachometer, Telescoping Steering Wheel, Steering Wheel Radio Controls, Sunroof, Moonroof, Driver Airbag, Passenger Airbag, Side Airbags, Security System, Rear Defogger, Intermittent Wipers, AM/FM, MB TEX Interior Surface, Carpeted Floor Mats, Center Arm Rest, Child Proof Door Locks, Daytime Running Lights, Heated Mirrors, Navigation System, Overhead Console, Reverse Camera, Roll Stability Control, Side Curtain Airbags, Tire Pressure Monitor, Vanity Mirrors -10.25 Digital Instrument Cluster Display, 10.25 Touchscreen Multimedia Display, 18 AMGr 5-Spoke Wheels, 64-Color Interior Ambient Lighting, AMG Line, AMG Line Code, AMG Line Sport Steering Wheel, AMGr Body Styling, Auto-Dimming Rearview & Driver-Side Mirrors, Black Headliner, Black Window Trim & Black Lamella Inlays, Blind Spot Assist, Connect20, Galvanized Shift Paddles, Garage Door Opener, HANDS-FREE ACCESS, Heated Front Seats, Inductive Wireless Charging with NFC Pairing, KEYLESS GO Package, KEYLESS GOr, Mirror Package, Night Package, Power Folding Side Mirrors, Premium Package, Sport Seats with Separate Headrests. AMG Line Exterior, AMG Line Exterior (772), Porcelain DINAMICA Headliner, Sport Package Code. 17/27 City/Highway MPG We know you would like to see this car up close so call Todd Frison, Isaac Weaver, or Matt Bourassa to schedule an appointment!! Proudly serving Gilbert, Casa Grande, Chandler, Scottsdale, Peoria, Surprise, Avondale, Tucson, Mesa, Phoenix. Please call 1-855-717-7620. - Air Conditioning, Climate Control, Dual Zone Climate Control, Cruise Control, Power Steering, Power Mirrors, Leather Steering Wheel, Clock, Tachometer, Homelink System, Telescoping Steering Wheel, Steering Wheel Radio Controls, Driver Airbag, Passenger Airbag, Security System, Rear Defogger, Intermittent Wipers, AM/FM, Anti-Theft, Leather Interior Surface, Adaptive headlights, Aux. Audio Input, Carpeted Floor Mats, Center Arm Rest, Child Proof Door Locks, Daytime Running Lights, Front Heated Seats, Heated Mirrors, Navigation System, Overhead Console, Rear Fog Lamps, Rear-Side Airbags, Reverse Camera, Roll Stability Control, Side Curtain Airbags, Tire Pressure Monitor, Vanity Mirrors -AMG Line Exterior, AMG Line Exterior (772), Porcelain DINAMICA Headliner, Sport Package Code. 4MATIC, 12.3 Digital Instrument Cluster, 19 AMGr Twin 5-Spoke Wheels, AMG Line Exterior, AMGr Body Styling, Black Headliner, Blind Spot Assist, Heated Front Seats, Lowered Suspension with Selective Damping, Natural Grain Brown Ash Wood Center Console, Parking Assist Code, Parking Assistance Package, Perforated Front Brake Discs, Sport Exterior, Sport Interior, Sun Protection Package, Sun Protection Package Code. 19/26 City/Highway MPG We know you would like to see this car up close so call Todd Frison, Isaac Weaver, or Matt Bourassa to schedule an appointment!! Proudly serving Gilbert, Casa Grande, Chandler, Scottsdale, Peoria, Surprise, Avondale, Tucson, Mesa, Phoenix. Please call 1-855-717-7620. - Air Conditioning, Climate Control, Dual Zone Climate Control, Cruise Control, Power Steering, Power Mirrors, Leather Steering Wheel, Memory Seat Position, Wood Trim, Clock, Tachometer, Homelink System, Telescoping Steering Wheel, Steering Wheel Radio Controls, Sunroof, Moonroof, Driver Airbag, Passenger Airbag, Side Airbags, Security System, Rear Defogger, Intermittent Wipers, AM/FM, Anti-Theft, MB TEX Interior Surface, 3rd Row Seating, Aux. Audio Input, Carpeted Floor Mats, Center Arm Rest, Center Console, Child Proof Door Locks, Daytime Running Lights, Heated Mirrors, Navigation System, Overhead Console, Power Lift Gate, Rear Fog Lamps, Rear Spoiler, Rear Spoiler, Rear Wipers, Remote Fuel Door, Reverse Camera, Roll Stability Control, Side Curtain Airbags, Tire Pressure Monitor, Vanity Mirrors -4MATIC, 12.3 Digital Instrument Cluster, 19 AMGr Twin 5-Spoke Wheels, AMG Line Exterior, AMGr Body Styling, Black Headliner, Blind Spot Assist, Heated Front Seats, Lowered Suspension with Selective Damping, Natural Grain Brown Ash Wood Center Console, Parking Assist Code, Parking Assistance Package, Perforated Front Brake Discs, Sport Exterior, Sport Interior, Sun Protection Package, Sun Protection Package Code. Car shopping in the Phoenix area? Look no further than the new vehicle inventory at Mercedes-Benz of Chandler. We have a wide variety of models in stock, from the popular Mercedes-Benz GLA to the fan favorite Mercedes-Benz C-Class. Our sales team is standing by to get you behind the wheel of the model that best suits your budget and driving needs, and we always have rotating vehicle specials to make the car-buying process that much less stressful. 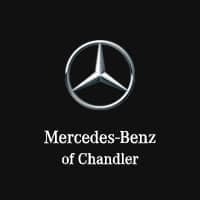 When you’re ready to take your commute to the next level, stop by Mercedes-Benz of Chandler to pursue the Mercedes-Benz models for sale in Chandler!